Give your wise kitty the nutrition he craves and thrives on with the Nutro Max Senior Roasted Chicken Flavor Dry Cat Food. Made with chicken as the first ingredient, it packs plenty of animal-sourced protein to fuel all those indoor adventures and maintain lean muscle. The formula is loaded with antioxidants for a healthy immune system, essential taurine for vision and heart health, omegas for a shiny coat, and a balanced blend of vitamins and minerals. Plus, it’s formulated with a kitty-approved flavor and kibble shape that’ll have your pal running to his bowl every time. Senior kibble formula is made with chicken as the first ingredient for the high-quality animal protein needed to maintain healthy muscles. 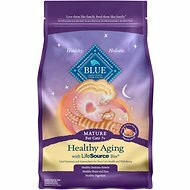 Unique kibble shape and delicious flavor is great for picky eaters, and provides a 100% complete and balanced diet for senior cats. The crunchy bites are packed with antioxidants for healthy immunity, taurine for heart and vision health, and vitamins and minerals. Provides a balanced blend of omega-3 and 6 fatty acids to promote a healthy skin and shiny coat. 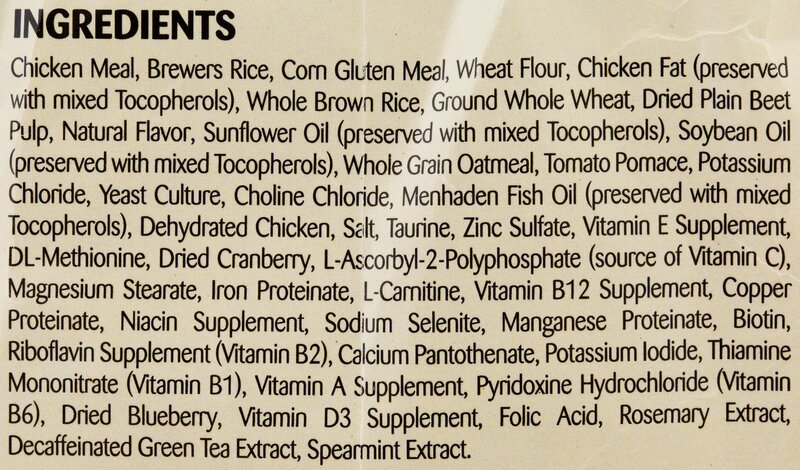 Chicken Meal, Brewers Rice, Corn Gluten Meal, Wheat Flour, Chicken Fat (Preserved with Mixed Tocopherols), Whole Brown Rice, Ground Whole Wheat, Dried Plain Beet Pulp, Natural Flavor, Sunflower Oil (Preserved with Mixed Tocopherols), Soybean Oil (Preserved with Mixed Tocopherols), Whole Grain Oatmeal, Tomato Pomace, Potassium Chloride, Yeast Culture, Choline Chloride, Menhaden Fish Oil (Preserved with Mixed Tocopherols), Dehydrated Chicken, Salt, Taurine, Zinc Sulfate, Vitamin E Supplement, Dl-Methionine, Dried Cranberry, L-Ascorbyl-2-Polyphosphate (Source of Vitamin C), Magnesium Stearate, Iron Proteinate, L-Carnitine, Vitamin B12 Supplement, Copper Proteinate, Niacin Supplement, Sodium Selenite, Manganese Proteinate, Biotin, Riboflavin Supplement (Vitamin B2), Calcium Pantothenate, Potassium Iodide, Thiamine Mononitrate (Vitamin B1), Vitamin A Supplement, Pyridoxine Hydrochloride (Vitamin B6), Dried Blueberry, Vitamin D3 Supplement, Folic Acid, Rosemary Extract, Decaffeinated Green Tea Extract, Spearmint Extract. Bought this for my senior cat. I'm used to her trying things out and then "meh" then my ferals get it. My 3yr. old little jerk cat loves this and I have to give her some or my senior cat won't get any. 5 yr. old cat loves it too, he's easier to fool when I'm feeding my senior cat. Guess I will have to get them their own bag for younger cats. Very large male cat likes Nitro Max senior Roasted chicken flavor. My very very large male tabby loves neutro max senior. He is almost 13 and isn't a fan of exercise. Anxious to see if he can drop at least a pound or two. 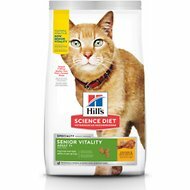 My cat is in the early stages of renal failure and studies show that instead of limiting their protein at this stage you limit the phosphorus in their diet, change the diet to a senior diet, and increase their water consumption. My cat is very picky, she'll pretty much only eat dry food. Most foods don't have phosphorus levels on their label but this one did. I tried another dry food before this one but my cat hates it. She loves this one! Sadly my cat didn't approve of this one. She loves chicken so I was trying something new again but she turned her nose up at this one. I would still recommend because all cats are different. I have two Siamese cats , they are indoor cat. 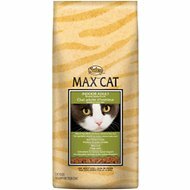 They always enjoying have maxcat roasted chicken dry food. They have been eating every day since they are babies. My 11 year-old indoor cat is doing much better since I started him on this. His mobility is better and he has slimmed down. Great product. I’m sure it makes an excellent food too but I use them for treats with pills for my fur babies!